Opera 5 opened a run of Rossini’s The Barber of Seville at the Factory Theatre last night. It’s arguably the most conventional thing Opera 5 have done. It’s a (very) mainstream piece. There was no accompanying themed food or drink (a glass of Rotsina?). There was no audience participation. There weren’t even Aria Umezawa’s characteristically minimalist touches. What there was a carefully constructed Barber for reduced forces directed by new Artistic Director Jessica Derventzis and conducted by Evan Mitchell. Casting has now been announced for The Overcoat: A Musical Tailoring; an opera by Morris Panych and James Rolfe based on Gogol’s short story by way of Panych’s 1990s theatrical version. The opera is a co-production of Vancouver Opera, Tapestry Opera and Canadian Stage and will premiere in Toronto’s Bluma Appel Theatre (March 29th to April 14th) before heading to the Vancouver Playhouse (April 28th to May 12th). All families, they say, have secrets. Few perhaps are as lurid as what came to light at 29 Kintyre Avenue, Toronto (about 2km from here) in the summer of 2007 when a contractor renovating the house discovered the mummified body of an infant wrapped in a 1925 newspaper. Incredibly, the CBC was able to track down the last surviving member of the household from that era, a 92 year old woman living in a retirement home in up-state New York. Her recollections, which formed the subject of a short two part radio documentary, provided a lot of context and background but few hard facts. Who the baby was and how it came to be under the floorboards remains very much a mystery. Gilbert and Sullivan operettas are such a stock staple of amateur dramatic societies in the English speaking world that one might think they were easy to stage. They are not. They are a tricky genre; entirely sui generic and strewn with as many pitfalls as the field at Bannockburn. The first and greatest is the primacy of the text and, embedded in that, W.S. Gilbert’s relentless guying of English Victorian society. A director really has to choose to go with that or come up with something really rather different. In Toronto Operetta Theatre’s new production of The Mikado director Guillermo Silva-Marin hasn’t really done either. There’s nothing very new in this production which seems to focus mostly on the visuals; streamer twirling and fancy fan work. One senses the mostly young cast have been left to develop their own characters without a whole lot of help. It’s a big ask and the result is that much of the time, even when the words are fully audible, one senses the players aren’t really aware of what and where the joke is. It’s no surprise then that it’s the veterans of the cast who get closest to the essence of the piece. 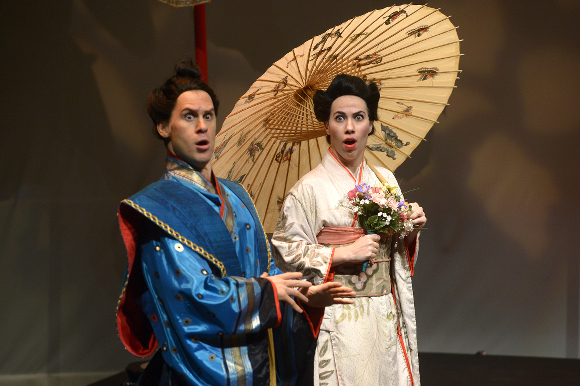 Both David Ludwig as Pooh-Bah and Giles Tomkins as The Mikado perform with sly wit and excellent diction. The Katisha of Mia Lennox is quite idiomatic too but perhaps lacking a bit of bite.